What’s more comforting than a pot of soup cooking on the stove? Making soup used to intimidate me, and the thought of making soup stock made me want to run away from my kitchen. I was pleasantly surprised to learn that both are quite easy. If you’ve ever roasted a chicken, you may as well make your own chicken stock, as the process is incredibly simple. Cover all ingredients with water and simmer (don’t let it boil!) away on the stove for about four or five hours, or put an oven-proof cooking vessel into the oven at a very low temperature so the stock doesn’t boil. The reason you don’t want the stock to come to a boil is because your stock will be cloudy and not very appealing to look at. Keep the temperature low enough (under 212 F or 100 C), and perhaps even use a thermometer to warn you if the temperature is getting too high. 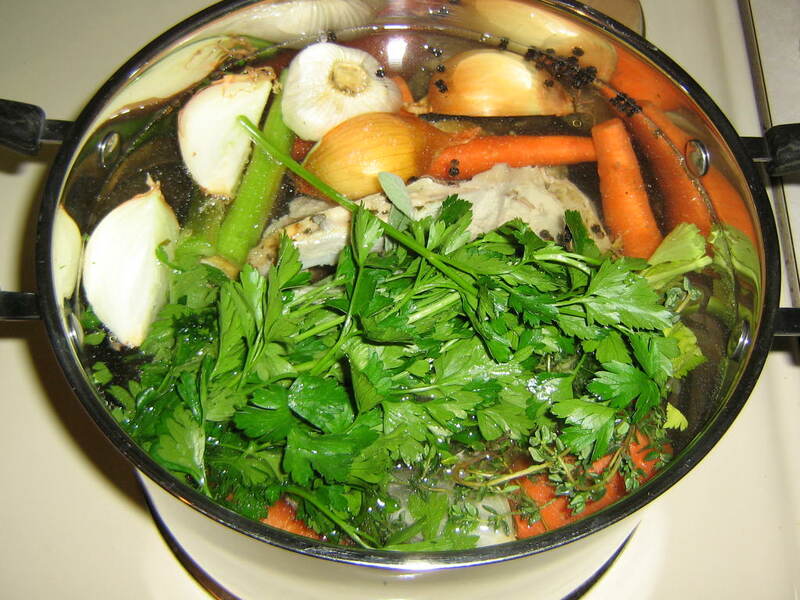 Remove the carcass and veggies, and strain the stock into a bowl. Cover and refrigerate overnight. The next day, skim the fat off the top of the stock. Either use the stock within three days or put into containers and freeze for up to six months. With homemade stock, you’re getting superior quality soup stock with no preservatives. It tastes better, and it’s better for you. *If the chicken came with the neck, go ahead and throw that in the pot. An inexpensive way to save stock ingredients is to save the peelings, ends, and skins from carrots, celery, an onions – just start a large freezer bag of stock ingredients. When you make chicken, throw the extra bones or carcass in the freezer until you’re ready to use them. If you have leftover parsley sometime, chop it up and freeze it into ice cubes, so you can just toss the cubes into your stock or any soup that you make.